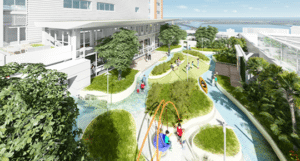 In December 2016, a group of architects, doctors, nurses and parents met to begin planning an outdoor play area that would rest on a rooftop of the new MUSC Shawn Jenkins Children’s Hospital. The architects passed out sheets of paper and asked everyone to write down words describing what they’d want people to feel upon walking into this space. “Wow!” “Family.” “Healing.” “Reflection.” These were just a few of the words used when envisioning this new play space. The architects taped the pages to the wall. The team, surrounded by the words they’d written, rolled up their sleeves and got to work. Over the next few days, those words grew into a thick stack of notes, ideas and colorful sketches that will finally come to life in an outdoor playground and healing garden when the new hospital opens its doors in 2019. The idea is to create a safe haven, away from the sometimes stressful environment associated with patient care. It will be a safe place with no pain, procedures and nobody interrupting them to do things to them. The area will represent family-centered care at its very best. It will provide a place where children can enjoy fresh air, sunshine and the sights, sounds and scents of the surrounding salt marsh and Charleston landscape, all in a safe and secure setting. Next post: Get Fit. Help Kids.